We offer financing through Synchrony Financial and run specials ranging from 1 to 24 months, same as cash (WAC). Come in and fill out a quick and easy credit application. We’ll have a decision for you in within minutes. Once approved, you may use your credit line for any purchase. See an associate for more details. 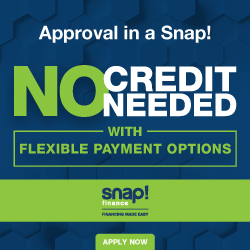 For those just starting to build their credit, we offer a SNAP financing program that does not rely on credit. Simply have a bank account and steady income and it’s interest free for 100 days. See an associate for more details.